The Chairman’s Award was presented by City Councilmember Jan Perry to the late Mikawaya CEO Frances Hashimoto Friedman’s husband, Joel, and son, Ryan. 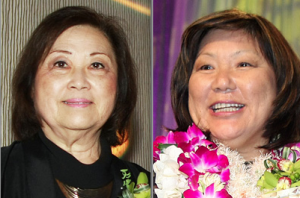 Three pioneers in the culinary field were recognized, one posthumously, by the Japanese American Cultural and Community Center at its 33rd annual dinner, themed “A Taste of Success” and held at the Beverly Hilton on June 30. Michael Hide Cardenas of Toranoko and Lazy Ox. 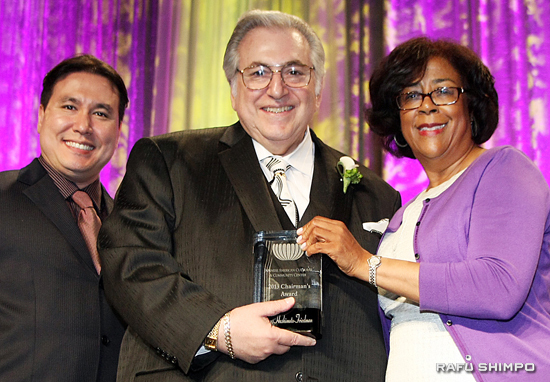 Three more individuals, nominated by the public, were honored for their community service. Sandra Sakamoto, JACCC board chair, thanked the event’s supporters, in particular title sponsors Paul and Hisako Terasaki and family, and introduced “our brand new CEO and president,” Leslie Ito. “‘Taste of Success’ highlights the strong culinary traditions that are the foundation of every culture, community and family,” Ito explained. “In my family it’s my grandma’s teriyaki chicken, tamale pie, corned beef and cabbage … It’s very JA … Through food and eating we also share our culture with others outside our community. Kanai was unable to attend as he was celebrating his 90th birthday in Japan. The Pacific Pioneer Award went to Akira Hirose, the owner of Maison Akira in Pasadena, who has contributed his culinary talents to numerous causes, including the JACCC. He was introduced by noted scientist and philanthropist Paul Terasaki. Chef Akira Hirose of Maison Akira. The Ambassador Award went to Michael Hide Cardenas, founder of the Innovative Dining Group, who has had great success with restaurants offering multiethnic cuisine in the Southland, including Toranoko and Lazy Ox in Little Tokyo. He goes back often to Japan, where he was born, to keep up with changing food trends. 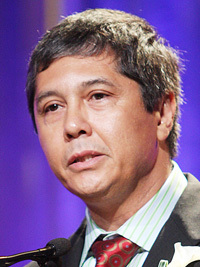 Emcee Frank Buckley, KTLA morning news anchor, recalled that he and Cardenas lived near each other in Yokohama’s Negishi Heights in the mid-1970s. Community Spirit Award recipient Leland Lau. 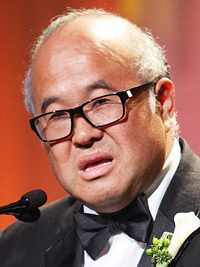 The Chairman’s Award went to the late Francis Hashimoto Friedman, an influential Little Tokyo business leader who served on JACCC’s board for more than 30 years. She took over the family business, Mikawaya, which she expanded from one retail store to four, and invented its popular fusion dessert, mochi ice cream. The Community Spirit Awards went to Iku Kiriyama, leader of the Japanese American Historical Society of Southern California and its publication, “Nanka Nikkei Voices”; Leland Lau, CPA, former president of Japanese American Optimist Club of Los Angeles and commissioner of JAO Invitational Basketball League; and Diana Ando, co-founder of Orange County Buddhist Church’s Project Kokoro and volunteer with Keiro Senior HealthCare. Ito noted that when the three were contacted, the response was the same: “I don’t deserve this award. There are so many others in the community besides me.” In fact, “they were absolutely the ones to honor, always putting the community and others ahead of themselves,” she said. Community Spirit Award recipients Iku Kiriyama and Diana Ono. “Everyone here is deserving of recognition, and we do no more than all of you do, and many of you do even more than we do,” Kiriyama said. “You help at schools, your church or temple, your community centers, sports leagues and the various organizations. We all give our time and commitment to carry on our heritage, history and culture, to care for our seniors and support our youth as future leaders. But we also recognize the need to reach beyond our community to work together for the common good in a diverse society. Ito honored five pioneers and JACCC supporters who have passed away in the past year: Sen. Daniel Inouye, former U.S. Ambassador to Japan James Hodson, Dr. Sanbo Sakaguchi, philanthropist George Aratani, and Frances Hashimoto Friedman. The “call to action” was continued by actress Tamlyn Tomita and Sean Miura, volunteer administrator for Tuesday Night Project. Noting that there are many hidden connections within the community, Tamlyn said that she just found out that Miura’s grandfather, former Assemblymember Paul Bannai, was friends with her late father, LAPD Sgt. Shiro Tomita. 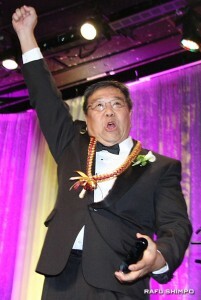 The raffle was conducted by the dinner’s co-chairs, Nancy Matsui of American Airlines and George Tanaka of Union Bank. The 2012 Nisei Week Court escorted honorees on and off the stage. Entertainment was provided by the Nikkei All-Stars, a band produced by Ishibashi/Stonebridge exclusively for this event; the Sounds of the Supremes, led by ’70s-’80s Supreme Karen Ragland; and Nanchuu Soran Tai Kaikyougumi from CSU Long Beach’s Nikkei Student Union. Leslie Ito, JACCC’s new CEO, addresses the audience at the Beverly Hilton.